Note: while all the stuff in this post is still accurate and it is a useful reference, I think that most people will find the solution presented here more useful. Since I got my Thinkpad W520 back in October, I have been in for an adventure in learning about the graphics. One of the reason's that I chose the W520 (and this is only one of many - it is an awesome machine) is that it was advertised to support two external monitors for a total of three including the Thinkpad display (now I know that some T-series can support four with the dock though). Earlier this week, I finally had two monitors in the same place to play with and had amassed the knowledge needed to get it all working right on Linux. I am a Linux noob, so this was a long journey that taught me a great deal about graphics hardware, the open-source world, and the insides of my beloved W520. The W520 uses a system called nvidia Optimus. You can find out more about it here, but basically it means that the Thinkpad Display is always controlled by the intel integrated card. When Windows 7 runs a program with demanding graphics, the nvidia card does the rendering and dumps the output to the intel card to display on the screen. I am pretty happy with the Lenovo engineers because they give the user the option to disable nvidia Optimus in favor of either the nvidia discrete or intel integrated graphics. In the BIOS (Access by holding F12 when the "Thinkpad" splash screen is displaying at startup), there are three options for the display configuration (note: the OS detection option appears to make the setting go to "nvidia optimus" when linux is running. This is usually not the desired behavior, so I recommend disabling OS detection). Discrete - Runs only the nvidia discrete graphics chip. The nvidia chip is connected to all three outputs, but sadly :,( it can only run two at a time (hence the '2/3' connection markings). Nvidia Optimus - In this mode, both graphics cards are running. The Nvidia chip is connected directly to the external display connections and the intel chip is connected to the Thinkpad Display. In Windows 7, there is native support for the cards to communicate over the motherboard, so everything works out of the box. In linux, the support must come from extenal tools (there may be native support in the future). Bumblebee can be used to render things on the Nvidia card and display them through the intel card, and a program called screenclone (see instructions here and here) can be used to display a desktop rendered on the Intel card through the Nvidia card to the external monitors. Use the "Integrated" BIOS display setting. This will only ever run the Intel graphics card. As far as I can tell, you will have to go into the BIOS and change the setting if you want to connect to a projector, but it is definitely possible to get decent graphics performance (compiz, 3d acceleration, etc) off of just the intel card. 2. "I just want everything to look nice and work!" and have fun with awesome performance! I have never had any problems with these settings, and using disper in conjunction with nvidia-settings to control external displays is a dream! I just feel happy when I think about this configuration! Battery life is honestly not that bad either - the nvidia drivers automatically underclock the card when usage is low. or, if you want to start it automatically every time you start your computer (not recommended), rename it xorg.conf and put it in the correct place (/etc/X11 in my setup). In this configuration (since xrandr is disabled by Xinerama), the only way to change the number of screens is to completely log out of X and use different xorg.conf files for whatever number of screens you have. With this configuration, you can only get 3D hardware acceleration on the external screens running on the nvidia card, and I don't think that it is possible to get desktop effects such as those that are part of compiz running. In the "Nvidia Optimus" BIOS mode, you can also save power by turning off the nvidia card when you are not using it. This can be accomplished using the bbswitch utility which is part of the Bumblebee project. If you are using ubuntu, you can get bbswitch from the bumblebee repository at https://launchpad.net/~bumblebee/+archive/stable . Instructions for using bbswitch can be found here. I hope that this post has helped you to understand your computer better, and I hope that you are enjoying your W520 as much as I am! This is terrific. Love the ASCII/Unicode graphics. Thanks for the Post! I will try that as soon as I have the time! By the way, do you use 64Bit or 32Bit? 64 bit - if you have more than 4 GB of ram (I think most W520 users do), you need to use 64 bit to use all of it. That's actually not accurate.. you just need to install the linux-pae module for your kernel if you want your 32bit O/S to have access to 4+GB ram. This supports up to 64GB of ram. I wasn't aware of that... thanks for the correction! A single thread can still only address 4 GB of memory. Let me start by saying I am a n00b!!!! I have W520 with Quadro 2000m and I just can't get it to work. My problem is that I need the nvidia capabilities. I need GLX support. When I choose discrete, X starts up looking strange and in tty it say that Display is not set. When I select optimus, X starts fine but nvidia-settings say I'm not using my nvidia drivers. If I then run nvidia-xconfig, X doesn't start at all; it just hangs. I am using the latest 290.10 driver from nvidia. If you are going to be using GLX, I think your best bet is to always run in Discrete bios mode to get the best performance. (In optimus mode, only the integrated graphics card is connected to the thinkpad display - hence nvidia-setting's statement that you are not using nvidia). in discrete mode from a tty. The output should be a line with nvidia and a few numbers. If nothing shows up, it means that the kernel module is not loaded. 3. You have Bumblebee/Ironhide installed. (Bumblebee will probably mess some stuff up if you are not booting in "nvidia optimus"). If you have it installed, I recommend uninstalling it, reinstalling the nvidia drivers, and then using jockey to make sure they're being used. As for Bumblebee/Ironhide - I don't know if I have it or how to check if I do, but I didn't install it. locate bumblebee and locate ironhide returns nothing. How can I enable the drivers? I went back to optimus (to be able to use X) and went to system settings->Additional drivers. It shows 2 nvidia drivers that are disabled. I installed them and rebooted. Now both are active but not in use. If I run nvidia-xconfig, X hangs and doesn't work. Should I purge nvidia* and install the 290.10 again? Anyway, deleting xorg.conf again and using optimus lets me log to X but GLX doesn't work. to show all the errors (replace \(EE\) with \(WW\) to see warnings). Nvidia say to put: driver "nvidia" in xorg.conf to solve this. When I do that, X hangs. Hmm... well I am pretty much a noob myself, so I'm not really sure what's going on to be honest. You could try sending the whole log to me (post it on dropbox or something) or post the warnings. What errors does the log give if you put nvidia in the xorg.conf? This is great information that I look forward to trying out on mt T520. One thing that worries me is that I connect/disconnect from the external monitor daily and I'd like to be able to do so without losing my session. I can do this now with an extended desktop using the Integrated BIOS setting and an external monitor (at reduced resolution) connected to VGA. Unfortunately in Optimus mode, I have not found a way to change the number of monitors without completely logging out of the graphical session because xrandr does not support multiple graphics cards as far as I can tell (If you figure out a way to do this, please do share). If you want to use your Display port output and connect and disconnect your external monitor on the fly, you need to use the Discrete BIOS setting (this all assumes that on T series the Thinkpad display is in fact connected to the discrete card in discrete mode). Really this is not a bad solution at all if you only want two monitors at any given time. The battery life on the discrete card will be reduced, but not horribly. If the system is saying that there is no available device when you are trying to insert the nvidia kernel module, then it is possible that you are inadvertently using the nouveau driver. I have had the problem with the booting with Discrete Graphics. It hangs after selection of kernel (Ubuntu 11.10, 64-bit, no Nvidia-drivers yet). Turning of VT-d allowed me to boot successfully. Now I'm finally running with at least two screens. I put my thoughts on the forum post. That's all I can offer - I can't really help too much with T-series laptops because I don't have one. I appreciate your feedback. From a graphics standpoint, I think W and T series are virtually identical. Any special ideas on getting the nvidia-settings to recognize the fact that I'm using the nvidia driver and preventing,... "You do not appear to be using the NVIDIA X driver. Please edit your X configuration file (just run `nvidia-xconfig` as root), and restart the X server." message. Also, I've had some issues with 3d ubuntu unity working with Discrete. Could that also be because bumblebee was interfering.. Going to try it today around 5 ET. I'll let you know what happens. The reason nvidia-settings wasn't working is probably because you are actually using nouveau. Use $ lsmod | grep nouveau to see if nouveau is loading. To prevent it from loading at startup, you can either blacklist it in /etc/modprobe.d or just uninstall nouveau. The driver install script from the nvidia website will ruthlessly blacklist it for you I believe, which is why that script works so well. Alternatively, I think if you install nvidia-current with apt-get, using jockey to enable nvidia might blacklist nouveau. The recommended ubuntu methods (apt-get and jockey) are careful, so they don't always work in weird cases like ours; the install script from the nvidia website is more of a brute force approach, but sometimes that is what you need when you have a weird system like ours. I don't see it running now. I'll give an update after I try your suggestion tonight. Thanks again for the quick feedback. Working well now. Using the nvidia driver in discrete mode. Thanks for your help. Is there a way to do this for Windows 7 users? They came with discrete nVidia Quadro cards. The motherboard has on-board Intel graphics which is disabled if a discrete card is present. My "problem" is that only 2 monitors can be active at any given time: the notebook's main monitor (which is constantly on) plus EITHER the slide out monitor (connected through an internal VGA port) OR 1 external monitor (connected to any of the video ports - VGA, DisplayPort, HDMI). The slide-out takes precedence. So for example, if you have the main notebook monitor and an external monitor on, then suddenly open the slide-out monitor, the external monitor is disabled. The desktop re-organizes to use the slide-out. If you retract the slide-out monitor, the external monitor resumes. I'd like to have the 3 monitors active, the main notebook, the slideout and external monitor. It's likely that the discrete nvidia card can only support a maximum of two screens by itself (that is the case for the nvidia card on the W520). So, in order to have three screens, you would have to run the nvidia and intel cards at the same time. I have no idea how to do this in Windows, or if it is even possible in Windows or Linux on the W701. It may be that there is a hardware switch that slaves all the screens to the nvidia card and cannot be overridden by software. I would think if was successfully performed on another Lenovo with discrete and on-board graphics built around the same time period, it may work on my machine as well. Of course, the big difference is Linux vs Windows. Even though the computers are in the same series and from around the same time period, they could be significantly different because of Optimus technology. I don't believe the 701 has optimus, and since optimus represents a fundamentally different approach to integrated and discrete graphics, it would not surprise me (although it does disappoint me) if the W701 only supports only two screens even though Thinkpads with Optimus support 3 or more. I need your help. I have to connect another monitor to my w520, I can connect one using thikdisp, but I can not use three and I would like to know in more detail how you do it. I am not very expert user in this, so I need a little help. I'm using bumblebee to get use another monitor. Thank you. 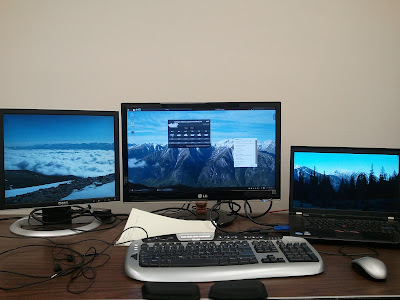 Using three displays is completely different from using two as you have been. You will not be able to use screenclone and thinkdisp to do this. Right now the virtual display patch for the intel driver that goes along with screenclone only supports one additional screen, so unless you can convince the author of that to enhance it, it is impossible to have three displays on a W520 with screenclone. Instead, to get three displays running, you have to start a special X-session using an older technology called Xinerama which uses both graphics cards together. There are some downsides to this - when you are running three displays, you will not be able to have fancy desktop effects, 3D acceleration will only be available on the two external screens*, and, most importantly, you have to logout of your graphical X session to change the number or size of displays. I do not have bumblebee installed, and I suspect that bumblebee will make it more difficult to get three screens up and running. So if you really want to do this, I would recommend creating a new small partition on your hard drive and creating a clean install of linux for testing (if you like the result on your test partition, you can do the same thing on your main one). You don't want to go messing up what you have now until you are sure you want three screens. If you decide you want to pursue this and need more detailed instructions on a step, let me know. And, if you get it working and want to know how I automate and use it day-to-day, I can describe that to you. Curious if you know why jockey-text -l returns nothing. if I try -e xorg:nvidia_current it says unknown driver..
jockey is still a bit of a mystery to me, haha. I believe that it only works correctly when you use only official ubuntu packages for everything, and even then sometimes it appears to not correctly find everything. Which method have you used to install the nvidia drivers? Did you use the installer on nvidia's website or the ubuntu packages? Right now, I have all of the nvidia stuff installed and working, and when I run jockey-text -l, I also get nothing. If you are having trouble installing nvidia drivers, I would recommend using the installer from nvidia's website. It doesn't jive very well with package managers, but it is a good brute force way of getting it working. Unfortunately I'm really no expert on how all of these things work together, and I don't have enough time to try out all the different combinations of configurations/settings, so I can't be of too much help. aptitude even says that nvidia-current is installed, but jockey-text -l returns nothing... I would say that it must be broken. ... or I just don't exactly understand what jockey is supposed to be doing. For some w520 with virtualization enabled in the bios, you will have problems booting ubuntu 12.04, 12.10 and lubuntu 12.10. As i understand, the 2 external displays are directly connected to the nvidia card, and the internal laptop monitor to the intel card. Therefore nvidia 3D graphics are (obviously) only available to the external screens. I was wondering if this is a linux/xorg limitation only. So basically, is, when using windows 7, the Nvidia 3D acceleration available on the laptop screen (via optimus) while running a total of 3 independent displays? Thanx in advance if you would be able to answer this one! Dennis, that's correct. When you're using Windows 7, the OS seemlessly determines what programs require the nvidia acceleration. If a graphically intensive program is used on the Thinkpad display, the nvidia card does all the rendering, and then loads the framebuffer to the intel card so it can be displayed on the Thinkpad display. So, yes, in short, you get to have perfect seemless integration and accelerated 3D graphics on all three independent displays on Windows without having to do any work. Thank you for your prompt response Zachary! Zach, the other day (maybe a week ago tops), I noticed that after an xorg X-server ubuntu update that something had changed with the handling of graphics. Formerly, I would have to reinstall the nvidia driver after each xorg version change because it would break the current configuration. This time, I noticed that there was support for controlling displays using xrandr and the native Ubuntu 'Displays' applet. This is much better than it was originally. Have you seen this change as well? And/or has anything changed in terms of support for Tri-Head display using the 'Displays' applet. Hmm... that sounds interesting. I am still on Kubuntu 12.04 with an old version of the X-server, so I have not experienced this update. Since a great deal of new laptops have nvidia optimus, I would not be too surprised if they are trying to integrate bumblebee or some other solution into ubuntu (however I know nvidia hasn't been getting along with the Kernel people too well lately, so I doubt that the good proprietary nvidia drivers will support things). My configuration has been static lately, because I need something that works, and don't have too much time for messing around. Do you have a W520 or a T520? The T520 has always supported an additional VGA display configurable with xrandr without use of the nvidia card. Even if bumblebee has been integrated into ubuntu, it seems likely to me that it will only support two displays for the W520 as it has in the past, and xinerama will still be needed for tri-head. GOAL: GLX working on any nvidia driver with at least a 1920 x 1080 X window display size. PROBLEM 1: X screen is 640x480 with no possibility of adjustment (System Settings>Displays) offers no size changes. Small screen makes using X impossible. PROBLEM 2: rewritten /etc/X11/xorg.conf doesn't work any better. Now I am back to my beloved 1920 x 1080 X-windows, with no nvidia and no GLX. Please offer advice on reaching my GOAL. The more detailed the command sequence, the better. Explanation is of secondary importance, and the less there is, the easier it is to run the commands. I will return the favor by posting a precise sequence of actions that leads to successful installation as it actually is done on my machine. It may help other thinkpad owners who I have seen struggling with this. Sorry for the delay (moved to a new city). I use this machine as a portable system, so having a 2nd display is unreliable but possible. I will do a clean install to achieve GLX support. Ok, these instructions are what will work for the W520 - I think they should work for yours, but might not be exactly the same. This setup will get you all the graphics acceleration you could ever want, but battery life will be significantly reduced. Let me know if you want to try something more complicated to get better battery life. Pretty crazy that I randomly found this while looking to fix some of my external monitor troubles. I have a W530 running Xubuntu 13.10 64-bit driving two external monitors via docking station. In the past I've successfully used bumblebee on the W530 without external monitors but ended up switching to discrete graphics only to get the external monitors working. I'm definitely going to try your tips on getting external displays to work with bbswitch/bumblebee. I was actually trying to find a solution to a different problem though. Currently I am very happy with my dual-head setup (I keep the laptop on the docking station closed), my only complaint is that the xfce login prompt is not displayed on one of my two external monitors. Do you have any advice on how to fix this? It is almost like my monitor settings are for the local user and I have to login before they take effect. Hey man! haha, it's funny that you ran into this. Beware that alot of the specifics in this blog might be out of date though. The general ideas still apply, but I don't really have the resources to be retesting stuff and keeping it up to date. I don't think xfce actually handles the login prompt. On most Ubuntu systems, it's a program called lightdm, and it's run by root, so I guess it wouldn't use any user settings. There may be a way to tell it to use some specific xorg.conf, but I'm not sure. I got rid of lightdm a long time ago - I just log in on a tty and start X myself (gotta get more hacker cred, haha ;) ). So is that KeyCpp project something that you did? That's pretty cool - Looks like it might be handy for engineers transitioning to cpp. Thanks for the help! There is a configuration file called /etc/lightdm/lightdm.conf. Adding a slightly modified version of this script and telling lightdm to run it through lightdm.conf fixed my problem. I had a lot of my research code written in Matlab but it didn't take very long before it was too slow for my needs. I started the KeyCpp project to try to make it easier to port my Matlab code to C++. It's mostly a Matlab-like wrapper around other numerical libraries. Are you still at A&M? I'm pretty isolated out here by the airport. Actually I'm not at A&M any more. I'm out at Stanford now. If you're ever out here for anything let me know though. I hope your research is going well. Are you thinking of graduating soon, or do you have a long ways still? Stanford...very nice! Hopefully they'll have an AIAA conference out there sometime soon. I have probably another 1.5 years or so before graduating. Hmm, I can't get this plan to work. I am using Ubuntu 12.04, and as far as I can tell, the nvidia driver is loaded, and nouveau isn't. (in the kernel) - i.e. lsmod | grep nouveau returns nothing. But Xorg.0.log says that X is loading the nouveau module anyway. Is that a different nouveau module? (An X11 module as opposed to a kernel module?) Could that be confusing my system? It sure is confusing me. Basically when I try to run the startx -- -config xorg.conf.triple.txt (btw is this supposed to run as user level or root level? ), it does not give me a login screen, just a series of "no protocol configured" errors, and "cannot connect to X server", then it times out and gives up. I notice that you have a couple of specific monitors listed in your xorg.conf.triple.txt, which don't exactly match mine. Do I need to rewrite that xorg.conf file with the details of my monitors? Also after I experimented with this, I could no longer log in with "sudo service lightdm start" either. (having used "sudo service lightdm stop" to go to a shell in the first place.) It would give me a login screen, but then when I entered my credentials, it would fail to log in and then just go back to the login screen. I had to switch to gdm, log in that way, and then after that I could switch back to lightdm. Also after I stop my existing login via "service lightdm stop", I can't just use "startx" to get a login screen with my previous configuration either. So I think the triple-head thing is not the problem, it is something else. I am trying to get the triple-head display to work with Nvidia Optimus. I don't care too much about graphics acceleration, I just want three independent screens. 3. The monitor vendor, model number, etc. in the xorg.conf shouldn't matter - I use the same file with a bunch of different models and different resolutions. Hopefully that eliminates some variables. Sorry that wasn't much help. I can't think of anything that would cause this to happen. You are in the nvidia-optimus mode in the bios, right? I've got a docking station for w520, w530, t520, t530 etc. If I put my t520 into the docking station, nothing happen. the internal display and the vga-display shot the same picture (cloned). Hmm... That is strange. I would expect it to not work at all if there is something wrong. I believe that on the T420 the VGA output was connected to the intel card instead of the nvidia card, so the xorg.conf for the W520 did not work correctly. Perhaps that is the case for the T530 as well. You may be able to change it by changing the device field in the VGA Screen section to tell it that the intel card is connected to the VGA screen, but I have no idea if that will actually work. Sorry I can't give more detailed help. Maybe it works with bumblebee, but i tried that with no success. Bumblee seems to be kind of hard to set up. Its not very attractive to me since hard to set up and i`ve read that it is buggy/rather experimental. My next try will be: Extending an additional screen over LAN to another machines display with XDMX. that would be a good alternative. But if someone has an idea of making this (tripple head on T530) work i`d still be thankful for some hints. Please reply to this if thats the case. This blog post saved me a huge headache :) Thanks for the awesome work!